Science news and information about the Sun-Earth environment. A solar wind stream flowing from the indicated coronal hole will reach Earth on Dec. 6th or 7th. Credit: NOAA GOES-13. Solar Flares: Probabilities for a medium-sized (M-class) or a major (X-class) solar flare during the next 24/48 hours are tabulated below. Would you like a phone call when geomagnetic storms erupt? Sign up for Spaceweather PHONE. "The huge green arch was very impressive," he says. "Even the nearly-full Moon did not stop the auroras from shining through." Note: The solar wind stream that caused these auroras is unrelated to the solar explosions described below. Consider it a bonus. ANGRY SUNSPOT: Solar activity is very high. New sunspot 930 has unleashed two X-class solar flares: an X9-flare on Dec. 5th and an X6- flare on Dec. 6th. 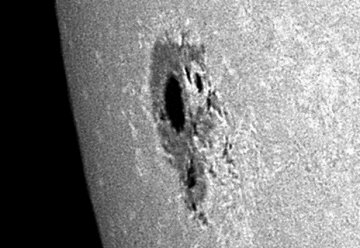 Sunspot 930 on Dec. 6th. Credit: John Nassr of the Philippines. Because of the sunspot's location near the eastern limb, the blasts were not squarely Earth-directed. Nevertheless, they might make themselves felt. Coronal mass ejections (CMEs) hurled into space by the explosions could deliver glancing blows to Earth's magnetic field as early as Dec. 7th, producing high-latitude geomagnetic storms. more images: from Gary Palmer of Los Angeles, CA; from Robert Arnold on the Isle of Skye, Scotland; from Chuck Baker of Carlsbad, California; from John Nassr of the Philippines; from John M Candy of Whitley Bay, North Tyneside, UK; from John Stetson of Falmouth, Maine; from Adrian Guzman of San Jose, CA. PLANETARY ALIGNMENT: Finally, a good reason to wake up early: Jupiter, Mercury and Mars are converging to form a tight triangle in the morning sky. Look for them, low in the east, beaming through the rosy glow of dawn on Dec. 8th, 9th, 10th and 11th. All three planets will fit together in the field of view of ordinary binoculars--a very pretty sight. Notes: LD is a "Lunar Distance." 1 LD = 384,401 km, the distance between Earth and the Moon. 1 LD also equals 0.00256 AU. MAG is the visual magnitude of the asteroid on the date of closest approach. NOAA Space Environment Center -- The official U.S. government bureau for real-time monitoring of solar and geophysical events, research in solar-terrestrial physics, and forecasting solar and geophysical disturbances. Atmospheric Optics -- the first place to look for information about sundogs, pillars, rainbows and related phenomena. Daily Sunspot Summaries -- from the NOAA Space Environment Center. Current Solar Images --a gallery of up-to-date solar pictures from the National Solar Data Analysis Center at the Goddard Space Flight Center. See also the GOES-12 Solar X-ray Imager. Recent Solar Events -- a nice summary of current solar conditions from lmsal.com. List of Potentially Hazardous Asteroids -- from the Harvard Minor Planet Center. Observable Comets -- from the Harvard Minor Planet Center. What is the Interplanetary Magnetic Field? -- A lucid answer from the University of Michigan. See also the Anatomy of Earth's Magnetosphere. Real-time Solar Wind Data -- from NASA's ACE spacecraft. How powerful are solar wind gusts? Read this story from Science@NASA. More Real-time Solar Wind Data -- from the Solar and Heliospheric Observatory Proton Monitor.